Just getting back in to the crafting groove after my holiday. We were so lucky to get away when we did as we missed all the bad weather caused by the Beast from the East here in the UK. Weather still a little chilly but hopefully it will start to get warmer before too long. I seem to have quite a few new followers either here or following my Facebook page so welcome to you all. 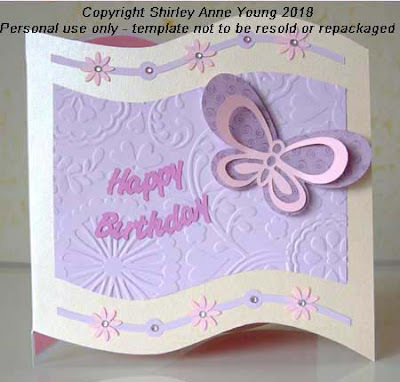 Now on to the freebie, it is a curved shape card which you can decorate as you like but the file does include the toppers I used in the photo. I used an embossing folder for the centre panel but I think patterned paper would look good too. Hope you like it.